But that’s’ where my interest in pork begins and ends. The rest of my family have another love in addition to bacon. Now when you’re a family of 5, negotiations are just a part of life. 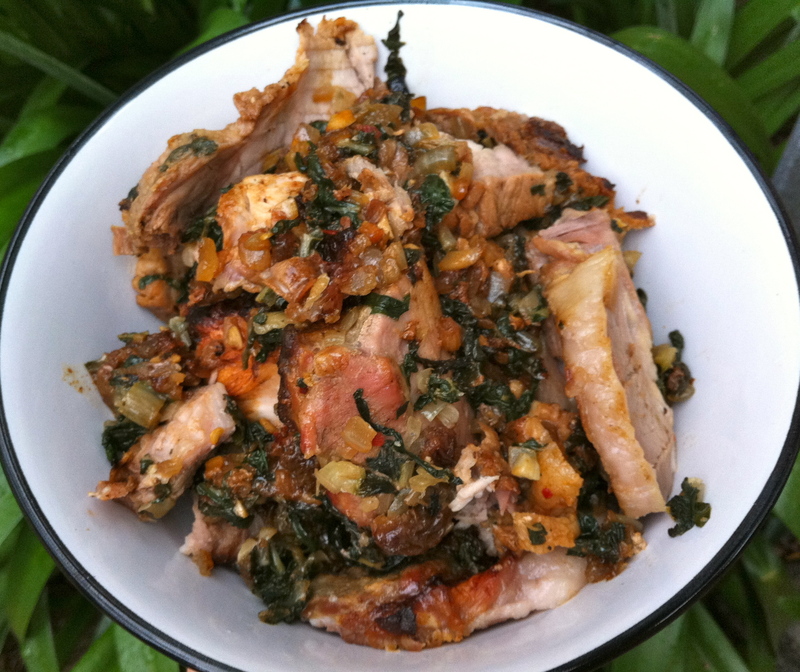 I get to stuff the pork loin with Swiss chard and raisins, and they get crackling! I followed Dorie Greenspan’s recipe, from her book ‘Around My French Table’, right up to the last step. But instead of patting crushed peppercorns and coriander over the pork roast, I substituted Donna Hay’s steps to achieving the perfect crackling! (My husband just read this and wanted me to stress how incredible the crackling was). *As soon as you get your pork home, remove the wrapping and place the pork on a plate in the fridge until ready to prepare. This makes the skin dry out, which helps create a crunchy surface. * To make the crackling really crispy, make sure the oven is very hot – preheat for about 20 minutes at 220 celsius. * Rub salt and oil into the scored pork after tying. Table salt spreads further than sea salt and helps give the crackling its crunch. I then cooked the pork for 20 minutes at 220 celsius, then reduced it to 200 degrees celsius and cooked it for another 50-55 minutes. I peeled potatoes and pumpkin, tossed them in a little oil, salt and pepper and added to the baking tray with the pork when I reduced the temperature to 200 degrees celsius. We all loved this dish. The stuffing flavoured the meat and the vegetables, really lifting and enhancing the flavours. The cracking was truly out of this world! I usually can’t get past the fact that I am eating fat. And I cannot wait to see what the rest of the French Fridays with Dorie group came up with! Tags: baking, cooking, food, french food, french fridays with dorie, pork, pork crackling, recipes | Permalink. (Personally, I don’t know what I would do without compromises in the house – we’d either all go hungry or be miserable with each other). I’ve never had cracklin, but now I’m drooling for some. Who needs meat when there’s delicious fat to be eaten?? YUM. Your roast looks delicious, but I would love that crispy crackling right now! I loved the coriander and peppercorn crust, but I have to say that yours looks amazing. Thanks for sharing the instructions. Nice post…love your dish. I decided if this roast did not turn out well I would remove the stuffing, shred the meat, and turn it into pork BBQ sandwiches…but it was good. Wow, that plate looks absolutely delicious! Sounds like you have perfected that technique. I would have much rather been a guest in your house this week than in mine. While you seem to have perfected your technique, mine still needs lots and lots of work. Well, if I had gone with the crackling I think I might have liked this dish a lot more!!! of the experience. Your dish turned out so delicious looking, glad you all liked it. 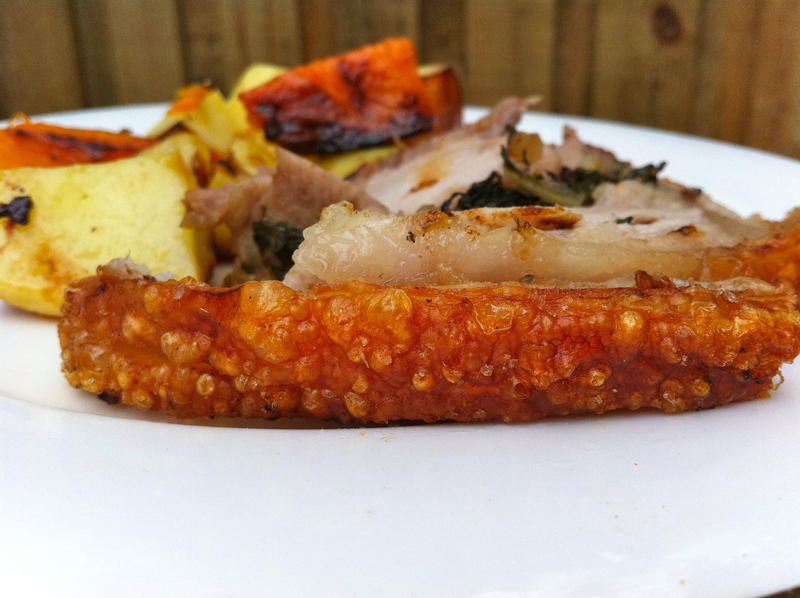 Oh my goodness, that crackling looks divine! I had no idea it was so simple to make! Cracklin looks divine and what a great substitute! Love Donna Hay! This is a great looking dish! I have never heard of crackling before, but it looks wonderful! I can just imagine how it must have tasted and I love the idea of having that ‘crunch.’ Great job! WOW! It looks just fantastic! I bet they all appreciated your efforts in the kitchen with this dish! 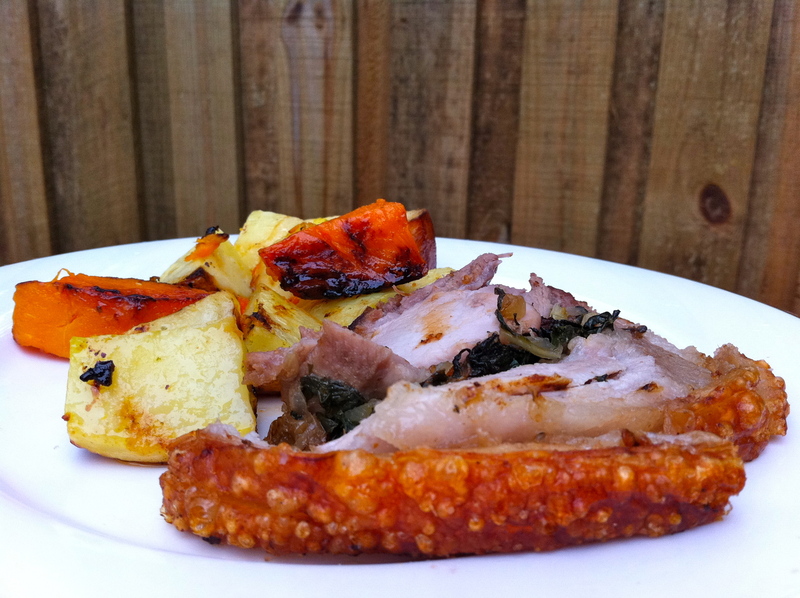 Never heard of crackling before, but it sounds great with this dish. I certainly want to try that out. Maybe in the next week? Thank you for the great idea and the recipe. I had the crackling on mine too. Love the idea of roasting pumpkin, like I would do with squash.